The rains have had an amazing effect on the veld. Lush grass and vibrant green foliage bear testimony to the end of the drought. The young impala are having a great time ! The veld is alive with the sound of impala. The herbivores certainly suffered during the drought and I believe that the numbers of zebra, wildebeest, waterbuck, buffalo, hippo and white rhino have dropped. How significant this will be, is not yet known. The resilience of Nature was certainly tested. While the grazers struggled, the predators all thrived. With the glut of weakened, nutrient-deficient prey species, the predators all had a great time. As an example : In 20 years at Tremisana prior to last year, there were a total of 4 buffalo killed around our lodge ; last year alone we had 7 buffalo kills ! It was sad to see the almost disheartened attitude of the buffalo when lions attacked – gone was the belligerent and aggressive reaction – it appeared that the buffalo were reluctant to put up a fight. 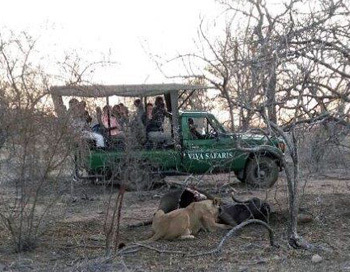 From a tourist perspective, the drought was a bonus : our guides had fantastic sightings of numerous predators – there were so many days that our guests saw the Big Five and Wild Dog and Cheetah. With the denser vegetation and abundance of water, it is now more challenging to find the animals. Given that we have 2 months of reports, I have significantly shortened all contributions. 3 December : Big Five before lunch. Easy Kapeasy ! 15th : Elephants on S125 road, lioness at Kumana dam, lions with a Giraffe kill on S 86, Leopard at Mazithi dam, buffaloes and Sable Antelope along Talamati road. White Rhino at Orpen. 25th : Lions Timbavati riverbed, Rhino S39, buffaloes Orpen road, leopard on S127, more lions S39 ,elephants everywhere. Big male leopard near Orpen. We found a pride of lions under a tree on S100. They had chased a male leopard up the tree. On the Orpen – Satara road a hippo died and a pride of 4 lioness and 5 cubs we present for about 3 days. Guests had to tolerate the smell as they took pics. Lion sightings have become so simple these days. If we don’t find the lions at Kumana Dam we are definitely going to see them at Mazithi Dam. There’s a pride of 23 which hang around Kumana dam. 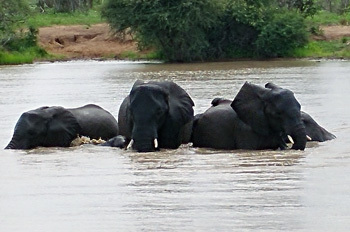 On one occasion this month a breeding herd of over 100 elephants came from the bush to the water. The entire lion pride fled into the bush. Leopard sightings have become very frequent due to less foliage on trees – no place to hide for them. We saw one at Kumana that had killed an impala next to the road – brilliant sighting! Hippo and Crocodile along Olifants river are guaranteed. We are regularly seeing 5 bull Elephants and 2 Black Rhino cows on Rome 1. 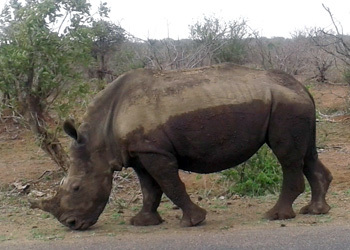 Zulu, the irascible Black Rhino bull, is often seen sleeping along Marula road. Barnard property has been very productive with regular sightings of 2 Bull Elephants near the airstrip; a pride of 9 lions near Bejwana dam and Black Rhino around Ngwenya dam. 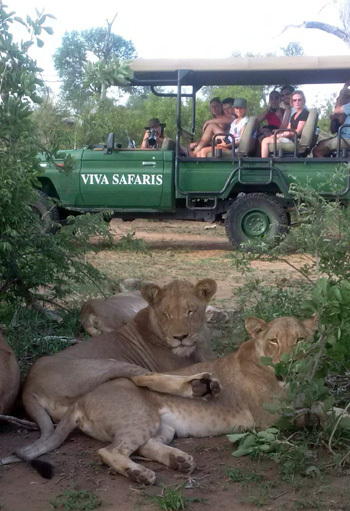 Close encounter with lions on Balule Game Reserve. Pride of 9 Lions at Xingamba dam and herd of Elephants at Ngwenya dam. 4th Dec : Near Nsemane Dam we found a male lion next to the road eating a young Kudu. On the 10th we found a leopard in a tree. On the 15th we saw Wild Dogs near Orpen gate eating an impala, and within 10 minutes, they caught another one ! On the 17th near Nkaya Pan we found 3 male lions feeding on a black rhino that had been poached that night. On the 20th we found a pride of 18 lions feeding on a giraffe at Kumana. The year 2016 has taught me a lot and I really enjoyed it. Christmas was celebrated at Katekani with guests and co-workers. Pierre the chef cooked us a beautiful meal with traditional Christmas pudding. 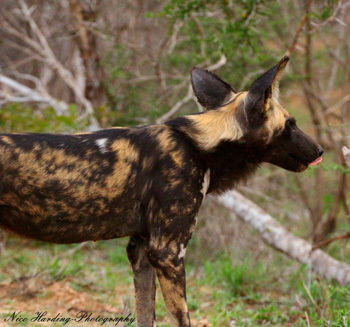 We have had multiple Wild Dog sightings over the past month as they have been hanging around the Orpen area. This has really spoilt our guests as they have had great close up encounters with this endangered carnivore. My lion sighting of the month was seeing four females and six cubs dig into a Giraffe just south of Kumana dam. Even though they are the laziest animals in the bush, you never get tired of watching them especially when they are in action. With the rains that have come and the grass growing again comes new life all around the park. 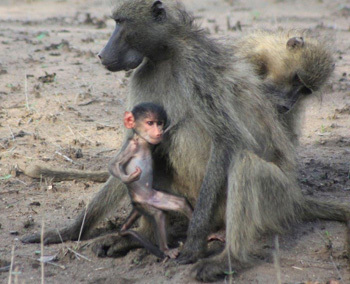 With loads of baby Impala, Wildebeest, Warthog and other species running around now is the perfect time to come and create your own baby album of the bush. I went out on drive and as soon as I turned into Ezulwini property it started raining – I had lightning next to the car. We eventually got out and went onto the Barnard property, My guests wanted to carry on the drive, and what a drive it was !! Driving about 500 metres on Nonwane cutline, we found lions lying down under a tree, scared of the thunder and lighting – like house cats. All of a sudden one of the young males stood up, walked toward the Landcruiser, once in front of the car stood still and stared at us for 2 minutes before walking off. Isaiah called on the radio to inform about a lion sighting. As soon as I arrived I switched my engine off and my spotlight on as it was dark. 2 minutes later we observed 4 young males yawning and roaring – what a fantastic welcome for my guests ! The hippos have returned to the dams on Barnards and we are seeing baby zebras – how cool ! On a Sunset Drive just before Marula Boma we had a great sighting of an elephant busy feeding. I then nearly drove into Buffalos which were lying in the road. So now we were stuck because there was no way around them. After sitting and waiting almost 10min, I started talking to the buffalo explaining that I have to pass them. As I got closer, one of the bulls got up and gave me an aggressive look. I revved the Landcruiser gently and he went off so that I was able to pass. Being so close to the buffalo made this my best buffalo experience so far. My guests loved it !! 2017 is here and no better way to start it than with going to the Kruger National Park for the day with an open vehicle full of excited guests!! With the overcast weather every few days I have experienced the predators to be a little more active and have had some amazing leopard sightings. Another plus about this time of year are all the babies! I was fortunate enough to have my youngest brother and my mother on different occasions visit me and experience what I do. It is always nice to show your family what it is you exactly do and also get them to experience wildlife at its best. This month the Olifants River has increased with more than double the water volume. 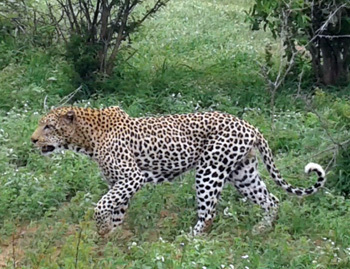 We have had great sightings of lions and leopards and a pack of Wild Dogs has been around in the second half of January. Luke and I got them at Tremisana dam one morning. These animals are on the endangered list so spotting them was a privelege for me. On one occasion along with my 4 lucky guests I had an incredible experience with an elephant bull : The Elephant came to next to our vehicle, very calm. He took some soil, splashed it into his face and he moved in front of us. Then the unexpected happened : he picked his trunk up and rested it on the bonnet – we were so surprised and then what ? Well he slept….yeah he took a nap on my bonnet with his trunk – what a sighting ! After 3 minutes, he woke up and looked at me and put his trunk onto his tusks and slept a further 5 min. Another vehicle approached and he turned around and started moving off into the Bush. What an unbelievable experience ! Kruger Park has recovered very well from the drought and now the thick bushes are making it difficult to spot animals. We managed to spend some quality time with the orphans at Funjwa primary school. Students from Santa Monica donated uniforms, toys for the orphans and stationery for Funjwa primary school. On the S41 we had some cool sightings : two cheetah made a kill just in front of our open vehicle. The cheetah went right in front of my vehicle at high speed towards the impalas. The impala herd divided and the young were running all over – very confused and one was caught after 2 seconds ! it. The cheetah grabbed the baby by the throat and dragged it to where they both had their meal. On the 8th in between the boom gate and the Reception we found 2 male lion fighting. The big male was disciplining the younger one. We also had some scary moments this month : On the 10th on an afternoon drive in Balule we found and elephant in musth that charged us. On the 17th on the Bush Walk we found a black rhino coming to us very fast. We hid behind a bush and he failed to see us. He finally walked back after marking his territory. On the 21st on the Bush Walk we found a breeding herd of elephant. We managed to approach and got quite close. On the 28th in between boom gate and the reception at Orpen we found a leopard with an Impala kill. On the S125 we found another one in a tree with his Impala. 1 elephant and 6 hippos along the Olifants river ; 2 crocodile out of the water. Later a big bull elephant in musth, and 2 Wild Dogs on the road near Tremisana, then 1 hyena sleeping on the road. 4 bulls buffalo at the river and 1 bull black rhino – Zulu – and 1 bull elephant in musth charging car. 3 black rhinos and 6 bulls elephants by the spruit. 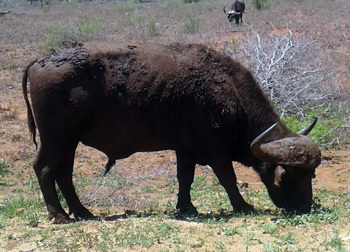 Buffalo Bull near the Olifants River. Herd of elephant on Barnard on Ingwenye dam and 4 hippos. Shugamba dam pride of 9 lions moving to Kambuku dam. Who says that Balule has gone quiet after the rains ??? 8th : White rhinos before Orpen reception, lions talamati road, leopard s125,elephants kumana dam and buffaloes ximangwanini dam and general game all over. 13th : Sable antelope on talamati road, lioness at mazithi dam, buffaloes at mudzandzeni picnic, elephants kumane dam, leopard near nkaya pan and white rhinos before nwanetsi bridge. 15th : lions s100 ,5 cheetahs 12km on s100 , hyenas and babies drinking at kumana dam, leopard on s125 crossing the road, buffaloes talamati road and 2 white rhinos grazing. 16th : lions s100 ,2 cheetahs on h 7 road ,leopard in tree near kumana dam, lions mazithi dam and buffaloes talamati road and at the last gate 2 white rhinos crossing the road. S100 we found pride of 11 lions – 5 cubs and 6 female close to the road. S125 we found more than 70 elephants crossing the road towards north. We found Wild Dogs – more than 30 – sleeping very close to the road on H7 Orpen road. We found 2 Leopard on S145 male and female; zebra more than 25 and buffalo crossing the road more than 80 and white rhino 6. 7 Sable Antelope neat Talamati. Tremisana Game Lodge has had a few improvements : we have upgraded the bush bathroom; we have added yet another staff room and we have cleared the thick undergrowth. Our monkey troop gets bolder and bolder and we employ staff at the Breakfast Lapa to keep these naughty thieves away from the buffet table. 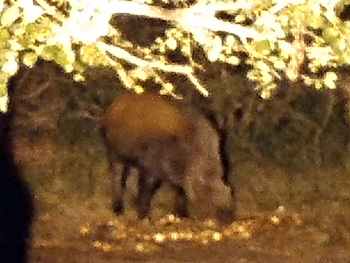 The Bushpigs have survived the drought and are seen late at night at the Lapa. Night shot of bushpig at our illuminated waterhole. Marc’s Treehouse Lodge has also had another staff room built. The Nyala have become even more tame and our guests love them. 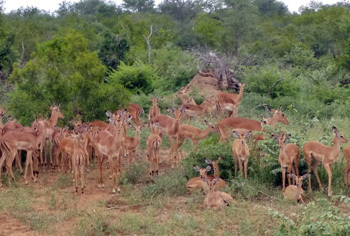 Katekani Tented Lodge has seen an increase in number of Bushbuck. We are on track to open our final two tented chalets on 1 April 2017. 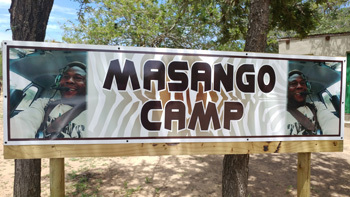 Masango Camp has been completed and we now offer 7 en suite chalets. Some of our less adventurous budget guests do not like treehouses or simple tents so this camp provides an alternative for budget tourists who want their own en suite brick and mortar accommodation. Viva Safaris had a fantastic year in 2016 – our figures show a growth in overall numbers of guests of more than 40% !!! We thank all our agents for their loyal support. Thanks too to our webmaster and computer whizzkid, Marco, who has ensured that our internet exposure has improved. 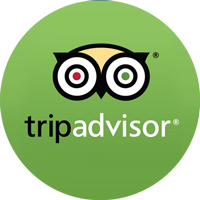 Of course the biggest thanks must go to our staff – the reviews on SafariBookings and Tripadvisor all indicate a friendliness and eagerness to please – starting from our room cleaners, through kitchen staff to hosts and hostesses and drivers and guides to receptionists and Camp Managers. It is sometimes very trying to have to please all the guests all the time – of course this is impossible but I am convinced that our staff are doing a great job ! Well done ! My husband and I stayed at Katekani Lodge for 2 nights following our first night at Tremisana Lodge for our honeymoon. It was just what we wanted and more. We just wished we had more time to relax, to enjoy our Lodge, chill in our private pool and appreciate our surroundings more, it was just amazing to hear the sounds of hyenas in the evening from your room. The structure of the days was planned very well, and there was a good mix of game reserves and Kruger. All guides with Viva Safaris were fantastic, Nico was great, very knowledgeable and so enthusiastic, he made us laugh. Victor who worked at Marc’s Treehouse Lodge who we didn’t see often but when we did he was always smiling, very happy chap and had some great stories to tell on our bush walk. What I will say is on the final day instead of our short bush walk, one last early morning game drive would have finished it off perfectly before the drive back to Johannesburg. As the travelling days are classed as safari days. In the evening we would have our meal sat round a table with Katekani’s other guests with Jochen and Mira, which was a lovely touch we felt like we had a little safari family for a couple of days. Jochen and Mira were great, not only were they very friendly and funny but also informative and made us feel very welcome. Pierre our own personal chef made the most amazing dishes he put so much thought and effort into each course. We thank all of the team very much for making our South African trip so memorable and incredible, certainly a honeymoon to remember! We hope that we can some day visit Katekani Lodge again, I’ve made sure we recommended this lodge to everyone. We just wish we had more time there! One of the most profound experiences of my life was spent with Viva Safaris! My daughter, who had recently graduated from college, and I spent six wonderful days with Viva Safaris last July. We both were impressed immediately with the correspondence leading up to our trip, the arrangement to be picked up at our hostel in Joburg, and the perfection with our entire trip. The accommodations were clean and comfortable, the grounds were beautiful, the food was great, the guides were friendly and knowledgeable and took great care in making sure we saw as much as possible. We took advantage of every drive offered…even 5am drives that we weren’t scheduled to take, if there were extra seats! I loved seeing not only animals, but birds too, and the guides were more than happy to point them out and stop to let me photograph them. On one day in Kruger we saw the Big 5 all before noon! We just can’t say enough about the great experience we had and highly recommend it! I was so pleased with the correspondence with emails keeping us up to date with a wealth of information. There was always someone on hand to answer any questions and very quickly too. I felt they were very professional and left nothing to chance. Deposits were paid in advance and I had no qualms whatsoever and the balance for the trip was paid too without any problems. I found the staff very friendly right from the start of our journey from the airport to the very end. The accommodation was very clean and comfortable. Every meal was well cooked and superb. Nothing was too much trouble for them. The guides were very friendly and smart with a wonderful sense of humour. I felt very safe even on our short walk away from the vehicle, trying to find the elephants that were near. My biggest thrill was stroking two cheetahs who had just killed and were very full lying down almost asleep. They each had one eye cocked ready for anything and then we come along! I could almost see them yawning and thinking, oh! it’s them again. I must admit we were all pretty cautious going in one by one, for these were real wild animals with the carcass of their kill just behind them. The guides certainly know their stuff and it was an absolute joy to see all the wildlife. It far exceeded my expectations and the night safaris were a real bonus. The sunrises and sunsets were incredible. I have no hesitation whatsoever going with them again. We are planning to go in 2018.